A big congrats goes out to Becky, who is our May Fitness Challenge winner! Becky set and met two of her weekly goals during the month. Great job Becky and congratulations! Leave a comment or send me an email with your prize choice from the list below. 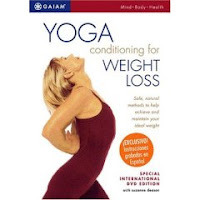 Yoga Conditioning for Weight Loss & Yoga Straps - I started doing y oga my junior year of college and I swear that my nightly routine was the one thing that kept me sane that year. I remember coming home for Christmas vacation and for the first time truly feeling relaxed. I did yoga for the first time in awhile tonight and afterwards I felt so calm. I welcomed the feeling whole-hearte dly as I've been a little stressed lately. The other reason I love yoga is that I'm not naturally very flexible, but after even a few weeks of conditioning I can feel my muscles loosening and my ability improving. Although I've tried a few different yoga dvd's I've never actually taken a class in a studio, but doing so is on my to-do list. Of the dvd's I've tried this one was the first one I used and the one I've kept coming back to over the years. There are a number of props you can buy to help in your yoga conditioning and I have a mat, which has been very useful, but the one thing I wish I had (because I'm not as flexible as I'd like) is a strap, so I'm going to throw one of these in too. Timex Watch - One of my constant workout companions is my Timex watch. I use it most frequently when I'm walking or running outside in order to time my workouts and to check my progress during my runs. I can't find my exact style on Amazon, it seems to be out of stock, but I'm liking this Triathlon model. The one thing I'm not sure it has, that I use alot on my model, is the pulse option. 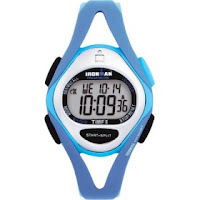 However, I love that it is water resistant up to 100 meters, which allows you to use it swimming, and I really love the training log and total run format/synchro timer features. I think these might actually make up for the potential lack of pulse option. The other thing I like is the based on the reviews it seems like this watch should be pretty easy to set, which is always a plus for a technology challenged person like me. 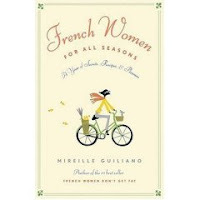 French Women for All Seasons: A Year of Secrets, Recipes, and Pleasure - This is the sequel t o French Women Don't Get Fat: The Secret of Eating For Pleasure, which I absolutely loved and reviewed here. I haven't actually had a chance to read this second book, but it is on my "to-read" list and I hope to do it soon. If anyone else has read this I'd love to hear what you thought of it! WOW! I can't believe I won! May wasn't my strongest month but I guess other people must have also been having a hard time this month! All of the options are great, Kate! It's a tough choice because I love yoga and need a strap, but I also need a watch and I have read the prequel to the book and will want to read that one too someday. I think, however, I will go with the watch, because I have been needing a watch for a LONG time and I dont actually even know how I survived my first year teaching without one. Plus, as you said, great workout features!